President Donald Trump railed against a lot of things last year. Chinese construction in the South China Sea was not really one of them, despite his campaign tough talk. Focused on North Korea and evidently enamoured of President Xi Jinping, the voluble United States President said relatively little as China continued to build on disputed islands, rocks and reefs. A recent Chinese report hailed progress in the South China Sea last year, noting construction totalling 290,000 sq m. That included work on hangars, missile shelters and large radar and and sensor arrays, according to satellite images reviewed by the Asia Maritime Transparency Initiative, a US think-tank. China claims nearly all of the South China Sea. In 2016, an international tribunal ruled against those claims, but the finding has largely been ignored - both by the Philippines, which brought the case, and by Beijing. 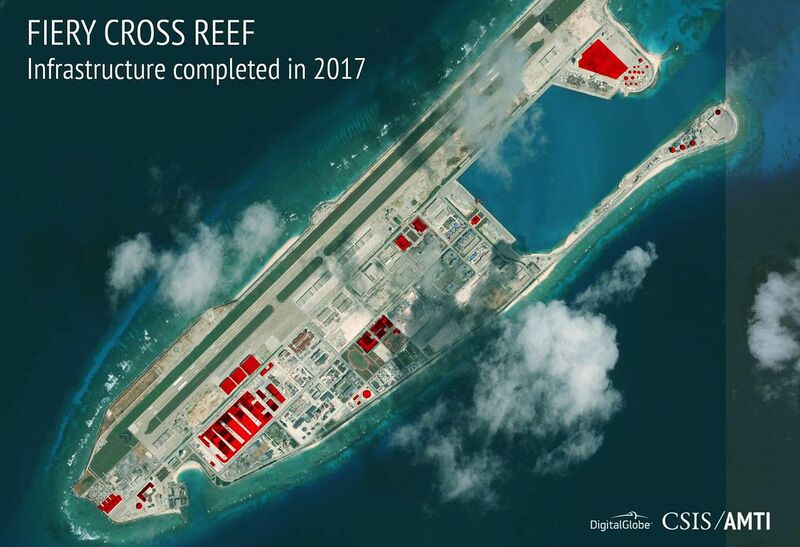 Having added thousands of hectares to the Spratly Islands in recent years, China is now building outposts there. Once operational, these bases will enable the Chinese military to better patrol the South China Sea, potentially changing the regional balance of power. It is both a territorial dispute and a test of regional influence, with an increasingly assertive China often appearing to set the terms. Though Chinese reclamation and building predate Mr Trump, many expected the Republican President to push back more forcefully than the previous administration. The National Security Strategy released last month does mention China's "efforts to build and militarise outposts in the South China Sea endanger the free flow of trade, threaten the sovereignty of other nations, and undermine regional stability". But experts see few signs that the issue is a White House priority. "Nobody in the White House is super focused on South China Sea stuff, at least as far as we know," said law professor Julian Ku from Hofstra University School of Law and an expert on the South China Sea. "I think it's going to remain on the back burner and that's definitely going to help the Chinese." The administration's quiet approach gave China a "free pass" last year, ceding ground at a critical time, said Dr Jay L. Batongbacal, director of the University of the Philippines' Institute for Maritime Affairs and Law of the Sea. "If (the Chinese do) base ships there and move in weapons, it will complete their planning, it will make permanent their dominance of the South China Sea," he said. "Because once they do that, they won't be pulling back." This year, that may create new challenges for Mr Trump. As a candidate, Mr Trump cast China as an always-winning upstart that ought to be cut down to size. China will "go in the South China Sea and build a military fortress the likes of which perhaps the world has not seen", he warned in 2016. "Because they have no respect for our president and they have no respect for our country." Most experts believe China will press ahead with both civilian and military building projects. Having constructed facilities for planes and ships, it may soon start rotating them through on a regular basis. But in his first year in office, Mr Trump has been the one showing respect, heaping praise on China's authoritarian President. A readout from his November visit with Mr Xi said Mr Trump raised the South China Sea issue, but he did not stress it publicly. In Vietnam, he casually offered to mediate - though there did not seem to be any takers. The President's approach so far has been to regularise the type of Freedom of Navigation Operations, or Fonops, that the Obama administration authorised in 2015. May saw the first Fonop of the Trump era, when a destroyer, the USS Dewey, sailed within 12 nautical miles of Mischief Reef in the disputed Spratly Islands. There have been several since. A spokesman for the National Security Council said the Fonops programme challenges excessive maritime claims by various states in order to preserve free movement on the sea and in the air. The problem, experts said, is that Fonops have thus far failed to stop Chinese building - and are therefore unlikely to stop whatever comes next. "Fonops are not a full strategy," said Ms Bonnie Glaser, a senior adviser for Asia at the Centre for Strategic and International Studies, in Washington. "It was not enough in the Obama era and it's not enough under Trump." Though Mr Trump has given no clear signs that he plans to make the South China Sea a priority this year, his hand may be forced. The President's push to get China to rein in North Korea is not going to plan. He has said as much on Twitter. In the months ahead, he will likely face pressure to take a tougher line with Beijing. "We know that the Pentagon, unlike the Trump administration, is very much worried about the South China Sea," said Dr Richard Javad Heydarian, a Manila-based security analyst. "The Pentagon is looking at options to bring the fight to the Chinese and up the ante there." The question is what the Chinese side does next. Most experts believe China will press ahead with both civilian and military building projects. Having constructed facilities for planes and ships, it may soon start rotating them through on a regular basis. Beijing could declare what are known as "straight baselines" in the Spratlys. These are in effect perimeters connecting the outermost points of a group of islands, turning the sea within into "internal waters". In the case of the Spratlys, straight baselines would enclose features occupied by other nations. China declared straight baselines in the Paracel island chain in 1996 and has in recent years signalled that it may do so in the Spratlys, a move that would be hotly contested and would almost certainly draw a US response. A less likely scenario would be Beijing beginning to dredge near Scarborough Shoal, a disputed, U-shaped reef not far from the Philippine coast. Since Philippine President Rodrigo Duterte took office in 2016, China has held off land reclamation there. If the Xi-Duterte truce falls apart, Beijing could decide to start crossing what has long been seen as a US red line. Any of these moves would require the US to rethink the status quo and take South China Sea strategy off "auto-pilot", said Ms Glaser. "There is not enough thinking about what the US will do to deter or respond to what will be the next Chinese actions in 2018."